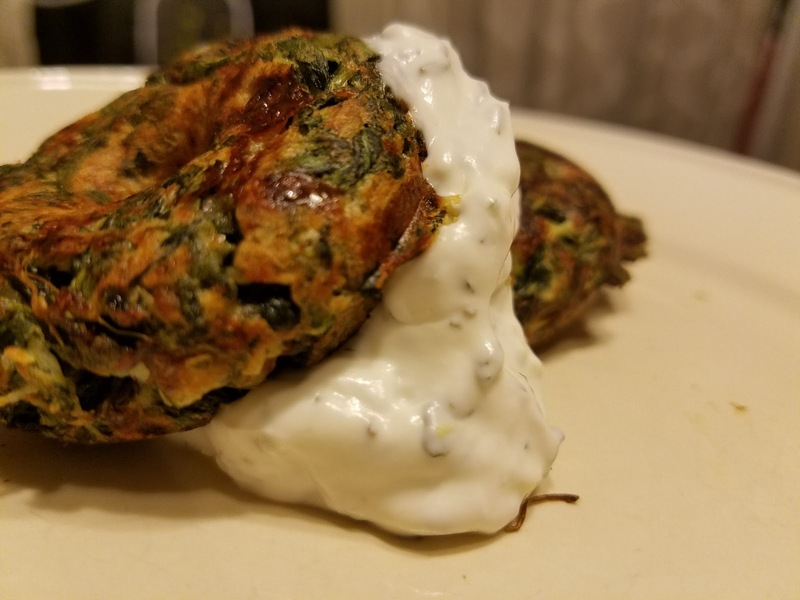 I've posted before about how much my oldest loves spinach pies. We were supposed to make some a couple of weeks ago, but I used the onion in another dish...forgot to get feta at the grocery...then the thawed spinach sat in the fridge for way too many days and I gave up. But she's been bugging me ever since. I haven't been myself lately. I have been getting treatment for a displaced disk in my jaw, which has been giving me a near constant headache for about 5 weeks so far. So my time in the kitchen has been limited. Our nutrition (and wallet) has been suffering for it. Plus, we had the promise of ice cream cake for dessert to celebrate our first daughter's birthday-in-heaven. So without a trip to the grocery store, what to have for dinner? Big bag of meatballs, and a peck of rainbow peppers to the rescue. But Dani doesn't eat peppers, so she bugged me again about the spinach pies. Oh, baby, I am tired. The kitchen is a mess. And spinach pies take a long time. It's already 6:00...fine. How can we do this, quick in a hurry, without adding to the mess of the kitchen? Hmmm, the doughnut maker is still on the counter from Sunday morning when we made peanut butter doughnuts with chocolate glaze (look up a cake mix doughnut recipe on Pinterest...add 1/2 cup melted peanut butter. Glaze is powdered sugar, cocoa powder, melted butter and water). What if we....? 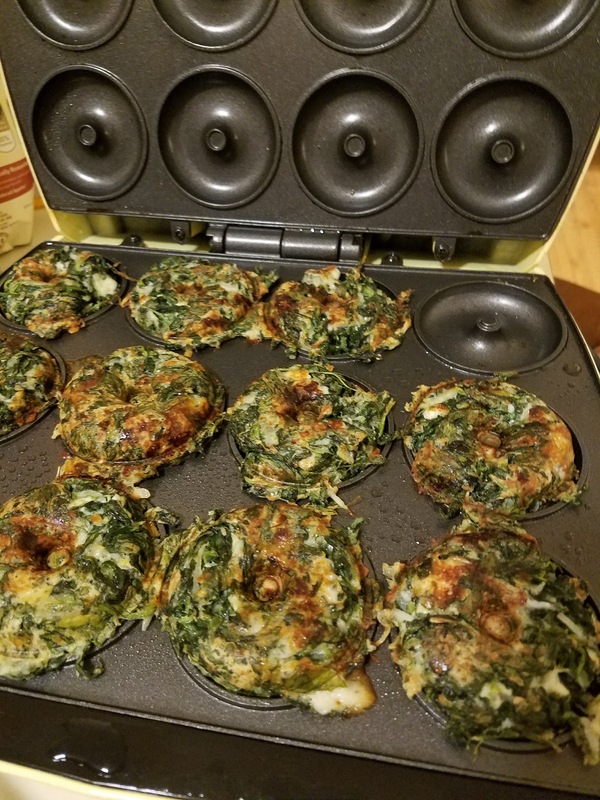 I quickly looked on Pinterest to see if anyone has ever done this before, cooking spinach pies in a doughnut maker. Nope. Maybe in a waffle iron? Nope. 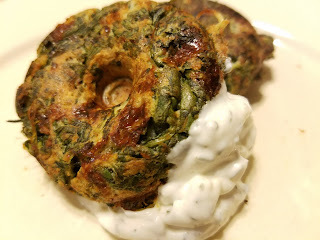 I did find a recipe for spinach and feta fritters that looked similar to my spinach pie recipe with some flour added. Well, why not? I mixed up a modified version of my Mini Spinach Pies and added a scoop of flour. Preheated the doughnut maker, sprayed it with some cooking spray and mounded the spinach mixture in the wells. The first batch, I kept peeking and poking. Dani said we should flip one out and test it so we did. It worked! I timed the second batch to see just how long it takes...8 minutes. Eight minutes! And I don't have to wash out 48 tiny muffin tin wells when we are done?? Hallelujah!! In that 8 minutes, I whipped up a dipping sauce for me and Ken with some mayo, sour cream, lemon zest, parsley, oregano, salt and pepper. 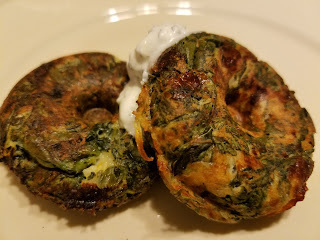 But these little "spindonuts" would be delicious with some tzatziki. The whole surface of the doughnut gets a bit of a crust on it, so it is a bit of a different texture of the mini muffin tin. I don't think I'm going back. 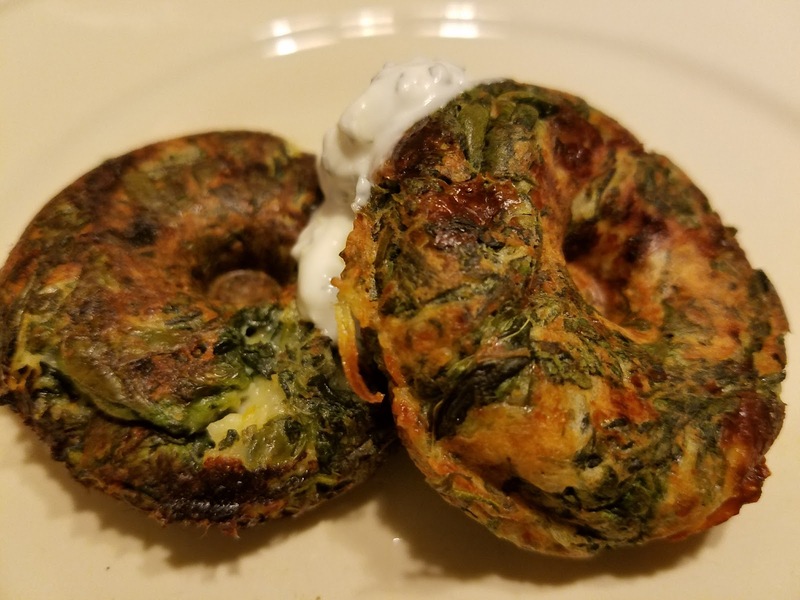 Ken and I do try to stick to a paleo diet most of the time, so I will try these with a different flour one day. In the meantime, we aren't so strict that a tablespoon or two of flour is a deal-breaker. Now, what is next in the doughnut maker? Any suggestions? My wonderful husband did not get me the InstaPot I asked for at Christmas. He is usually pretty good with presents and gets me either what I ask for, or something that is life-changing for me. Past gifts: curved shower rod (I hate touching a wet shower curtain), gel mat for the kitchen (my feet hurt when I do alot of cooking), door mat that says "Door bell broken, yell "Ding Dong" really loud (I asked for that one). So when he set a pile of gifts in my lap on Christmas morning, not one of them was big enough or heavy enough to be an InstaPot. I admit, I was a bit crestfallen, sorry honey. Then I tore into the sparkly paper. Under the packages of eight bottles of vinegar (we make vinegar sodas with flavored balsamics...delicious, gut-healing, and cholesterol lowering to boot) was a moderately heavy rectangular box. In the box was an immersion cooker. I have seen this method of cooking on television, mainly on cooking competition shows. My reaction, after the initial "This is NOT and InstaPot!!" was "this is cool, I'm looking forward to trying it." It wasn't until Christmas night that I had a chance to surf Pinterest for ideas, where my "this is cool" tuned into "I can't wait to try this thing!!" A trip with friends and our annual New Years Day crepe fest meant I had to wait a couple of weeks. Well, I didn't have to, but it took that long to finish off all the holiday left-overs. 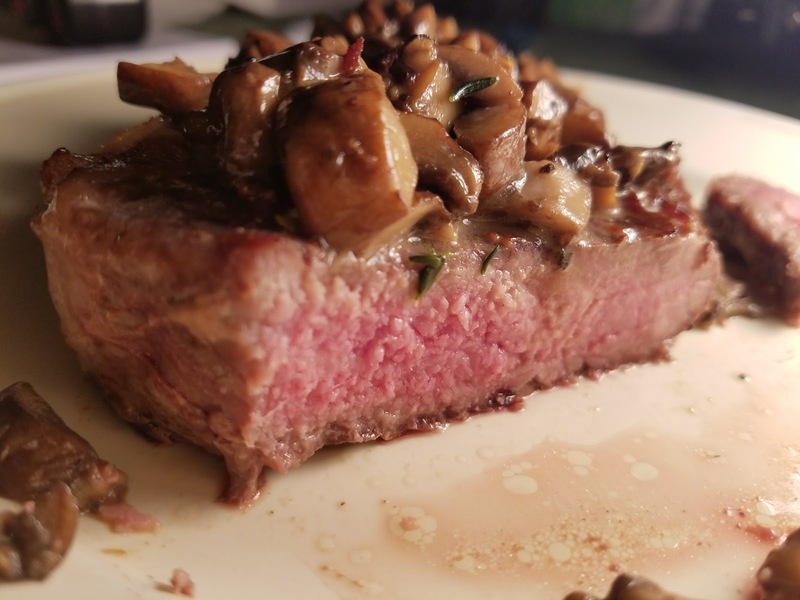 Still had a couple of NY strips left in the freezer from the cow we bought last year, I researched a bunch of sous vide recipes for steak and combined them for dinner last night. 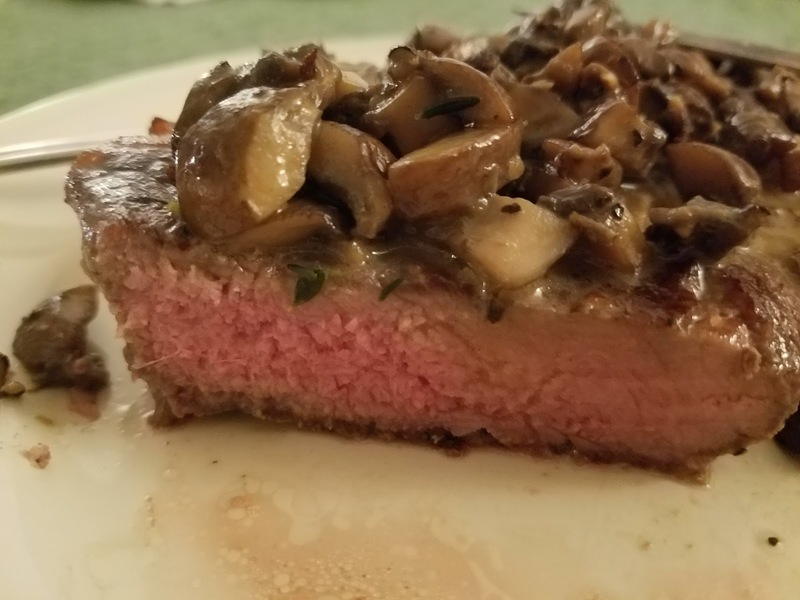 One of the steaks was still half frozen, but I figured (correctly as it turns out) that it wouldn't matter. 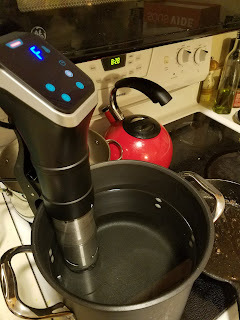 Here is how the immersion cooker works: you vacuum seal (with a machine or inside a zipper seal bag) the food you are cooking and immerse it in the water. You clip the cooker to the side of the pot and set the temperature and time and it circulates the water and keeps it at a consistent temperature. It is impossible to overcook the food. I have always been intimidated by cooking meat. It is expensive if you mess up. I've gotten more confident by the addition of a good meat thermometer to my kitchen, and through practice, I can tell by feel when pork chops are done. But I have stopped using my crock pot when I am not home because I have ruined more than one pork loin (how can it be tender and dry at the same time??) and burned beef roast at least twice. Sous vide, though...I can totally see me setting that up in the morning and walking away! Last nights experiment was NY Strip, salted and peppered and sealed in a zip-top bag with a pat of butter, a sprig of thyme and a sprig of rosemary. Two of these, actually. Sous vide-ed (not sure if you can use that as a verb) at 135 degrees for about an hour and a half. I set the timer for 2 hours, but got really hungry and pulled it out when I couldn't wait anymore. 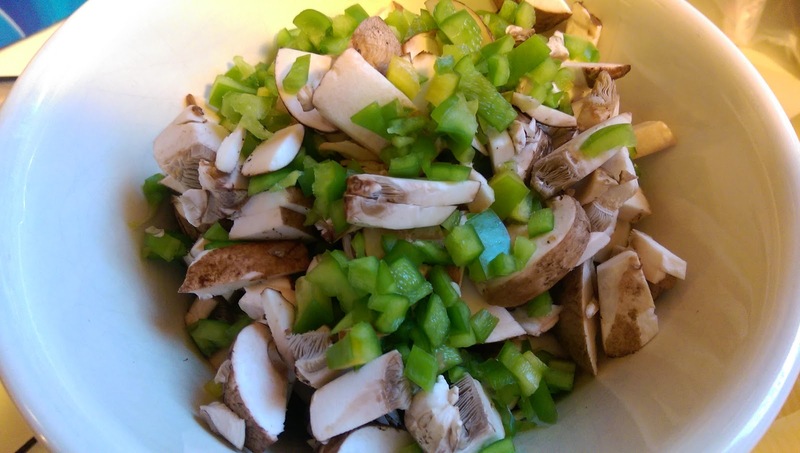 My littlest had chopped up some mushrooms before her dinner, so those were ready and waiting. I set a cast iron skillet to heat up and pulled out the steaks from the bags and patted them dry with paper towels. Into the hot skillet with some oil and flipped after about a minute. In a nook in the pan, I put a pat of butter, a squeeze of garlic from the garlic press, and a few sprigs of thyme. The intention was to spoon the butter over the steaks while they cooked, but I couldn't manage that...aww, I have to try this again (read with heavy sarcasm). 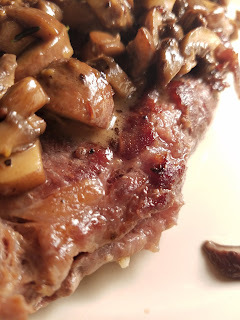 Steaks out of the pan and covered to rest, mushrooms in. 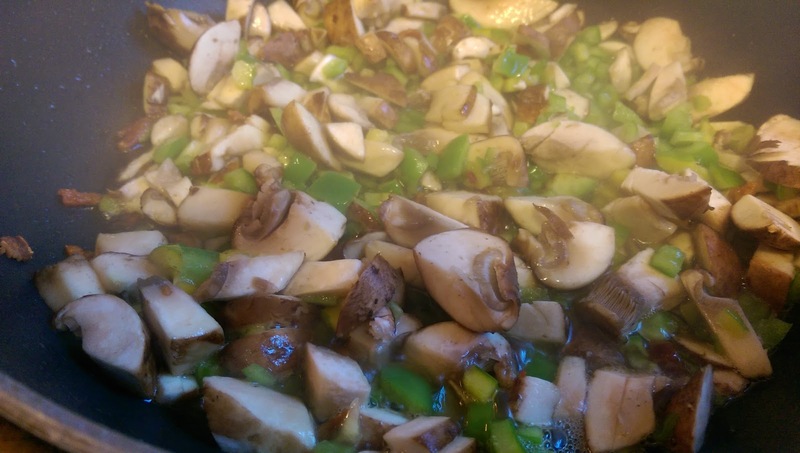 Some salt and pepper, a little white wine and a splash of heavy cream and the mushrooms were "kickin" (Ken's words). Oh. My. Goodness. The steaks were perfectly medium. Pink all the way through and cut like buttah. Three bites in and I cracked open a bottle of red wine. I have never felt like more of a food snob than I did last night! But I tell you, I am never again making a steak any other way! Sous Vide is the way to go! Check out my Pinterest board "Sous Vide" if you are wondering what I'm making next. To my Hubby: Thank you, baby, best Christmas gift ever!! Wait...you really enjoyed that steak last night...was this gift for me, or for you? Homemade ketchup! The thought came to me yesterday while I was showering (I get lots of thinking done in the bathroom--it's my only alone time anymore). It was Monday and we didn't have any plans--no school, no camp, no doctors. Our friends were coming for a mid-morning swim but the rest of the day was ours. Perfect to do a bit of kitchen experimenting...hmm, what to make...how about--SPIDER ON THE CONDITIONER BOTTLE! So now I'm playing "Naked and Afraid--the Home Edition" in the shower with a spider! Every few seconds, I'm checking on the spider to be sure he's not moving. Wet my hair...there is the spider...wash my hair...there is the spider...use a different conditioner...there is the spider...wash my face...Where. Is. The. Spider???? Now it's "Naked and Afraid--the Deluxe Home Edition!" Don't shave the legs, time to get out of the shower! The biggest child will just have to deal with my (her words) "porcupine porky thighs" when she sits on my lap. Back to The Plan...When we planted our garden, we planted two kinds of tomatoes. I was hopeful that if the children grew them, they might eat them. Hubby eats tomatoes infrequently and I only like them cooked. 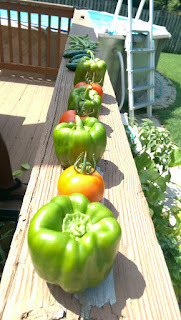 I also figured that if we grew enough, we'd be able to make some salsa or homemade sauce. My business partner's father used to make homemade ketchup every summer before he passed away. Last year, she resurrected the tradition and brought me a quart of it. When I suggested ketchup to the children, they were all over it. 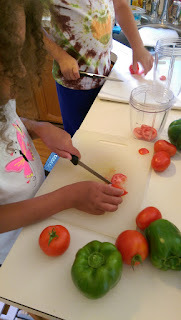 First we picked the tomatoes and peppers from the garden (we already had about 10 little tomatoes on the counter getting ripe). Next, I put sharp knives *gasp! * in the hands of my children (no worries, I have taught my children kitchen safety years ago). A moment later, I scooted the littlest away from the biggest...I had put a righty on the left side of a lefty, and the righty talks with her hands. Even if there is a sharp knife in them. 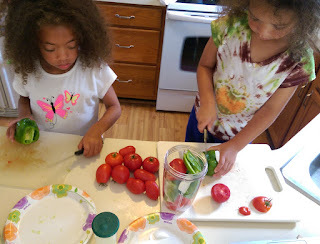 The children cut up all the tomatoes and the peppers. I cut the onion (if you've read my book, you'll know it's from experience). Then we put everything into the cups of my nutri-bullet. 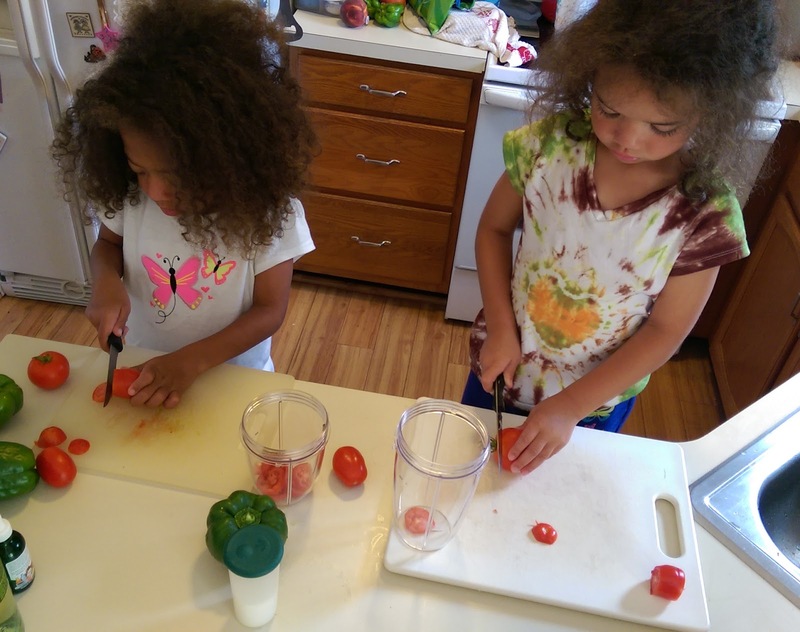 The littlest was very excited to make ketchup smoothies! 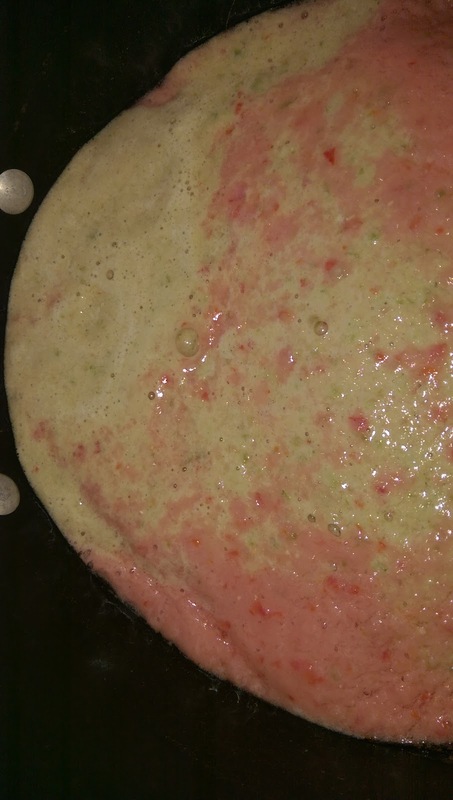 We did it in batches, so some of the puree was greener than others because of the amount of peppers in the batch. Everything was very pink when mixed all together. Not to fret, as the mixture cooks and reduces, it gets a beautiful brick red color. We boiled the puree for about 30 minutes until it was reduced by half then we added garlic, vinegar, ground mustard, cinnamon, cloves, cayenne pepper, smoked paprika, salt and honey, and forgot to take pictures. Then I turned the stove to low and checked on it every 10-15 minutes for about 2 hours. It tasted great, but still had a kind of mealy texture so I ran the immersion blender through it for about 7 minutes. It got glossy and thick. 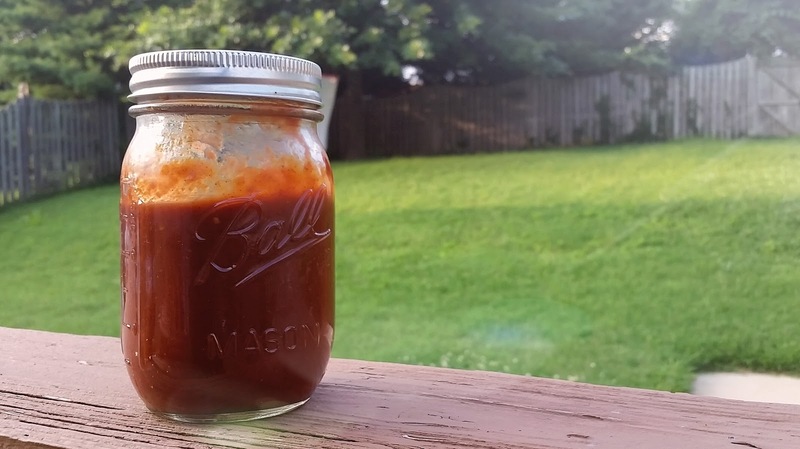 I didn't set out to make paleo-ketchup, but it is paleo. No thickeners, no sugar, and a bonus of very little salt. One taste and the hubby said "throw out the Heinz!" So I feel like this is one more step in total food-snobbery. That's just great, (insert sarcasm here) I've ruined store-bought ketchup for my entire family! We ate it on burgers and smiley face fries for dinner (and chicken and bratwurst...we did some cooking on the grill to stock up the freezer and you just gotta sample everything). This jar won't last long--it was full before dinner. Next summer, more tomato plants! We already have plans for balsamic ketchup, roasted jalapeno ketchup and maybe something herbaceous like thyme and oregano...any other suggestions? 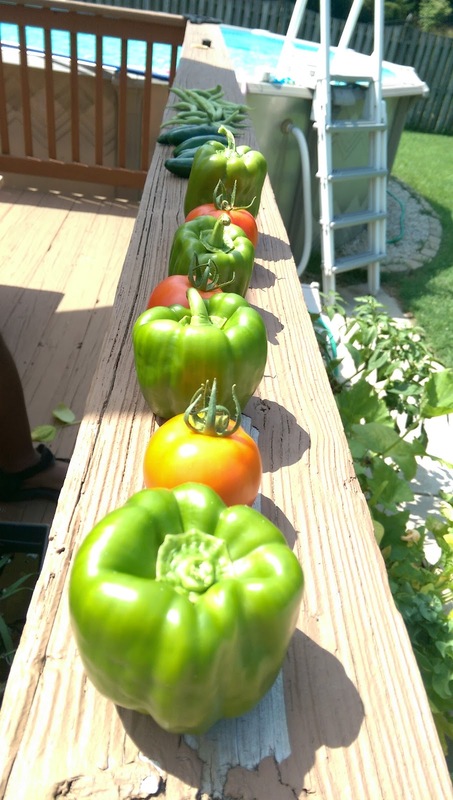 I'll let you know how it goes with the next tomato harvest. Chop then blend tomatoes, peppers and onion in a blender and pour into saucepan. Boil over medium-high heat until reduced by half, about 30 minutes, stirring frequently. Reduce heat to medium and add remaining ingredients. Bring back to boil and turn to low, simmer on low for about 2 hours or more, until mixture is thickened. If the mixture is "loose" or mealy after 2-3 hours, use an immersion blender to blend smooth. Store in fridge or using proper canning methods to preserve. I feel like I have to apologize for my absence. Sometimes I just feel like I can't get my feet under me. Then I have a wonderful day like today...both kids with me all day, had my annual physical (which had the girls waiting an hour and a half total), lunch at a restaurant (at their request), hair cuts for both of them (I had them cut 6 inches off the littlest's hair and worried that the hubby wouldn't let me back in the house), a shopping trip to Wegmans (where the biggest asked me to make stuffed shells, who am I to argue), then back home to do some batch cooking. And we all had a great time! Ooh, and in the middle of cooking, the littlest decided that she wanted to swim with just the kick board and no life jacket, so I jumped in the pool with her and she took off. Just two weeks ago she wouldn't let go of the ladder! When I get done here, I'll be looking for some swim lessons and a swim team for her--she's a natural. 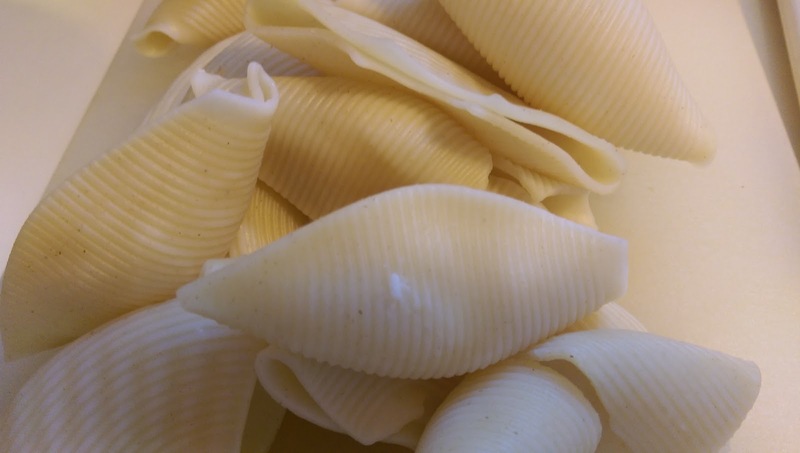 Knowing that I need to stock up the freezer for my mom, who is having shoulder surgery in a few weeks (if anyone has any ideas on good foods to freeze that can be heated and eaten one handed...please let me know), I cooked the whole box of shells. I made some traditional stuffed shells. Then ran out of ricotta cheese. So I had these left. I didn't want to throw them out, but I couldn't find inspiration in my kitchen, so I turned to Pinterest. Know what's not on Pinterest? 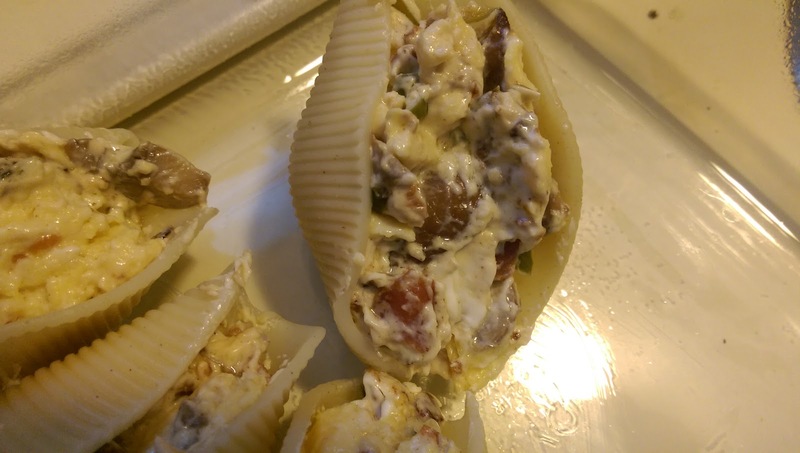 Breakfast stuffed shells. There should be breakfast stuffed shells on Pinterest. Ahem. Somebody needs to pin this recipe. Had to send the hubby to the store for cream cheese, but I had the bacon, mushrooms, peppers (from my first garden ever!) eggs and cheese in the fridge. I'm sure anything you'd eat in an omelette will work. 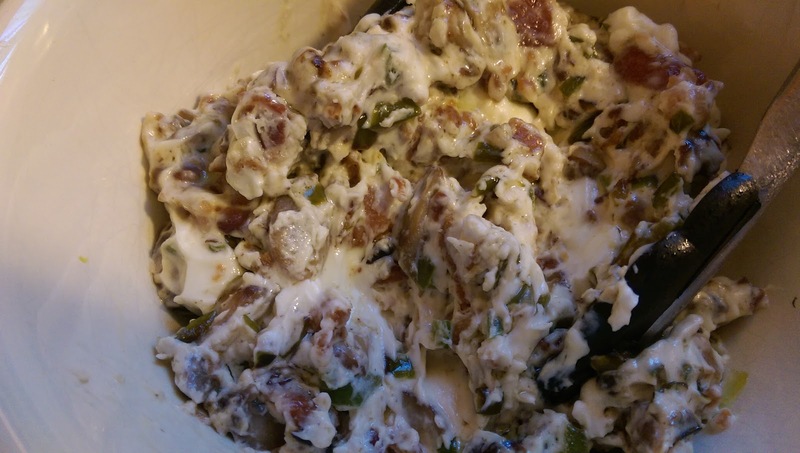 Our friends make "crack dip" with breakfast sausage and cream cheese, that would be delicious. Chop up your veggies and have them on-deck while you cook the bacon. Pull the bacon out of the pan and cook your veggies in the bacon grease. After the veggies are softened, throw a brick of cream cheese in the pan and stir until everything is melty goodness. Then stir in the cooked bacon and pour into a bowl and set aside. 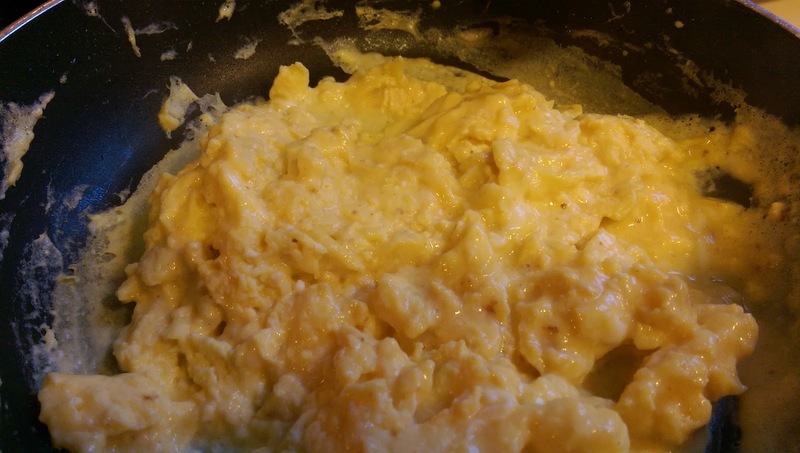 In the same pan, soft-scramble some eggs. Then mix the cream cheese goop back in to the pan and lightly mix with the eggs. Stuff into the already cooked shells. Oops, no pictures, but make some cheese sauce while the bacon and veg are cooking. 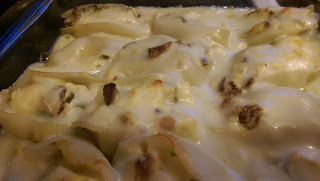 Pour the cheese sauce over the shells and bake at 350 til bubbly, about 20 minutes. This is a great brunch dish, but it is a bit rich and needs something acidic. We ate it with a spoon, standing in front of the stove. If I was serving it to someone, I'd top it with something tomato-y (like a tomato and roasted red pepper sauce) or on the side of an arugula or frisee salad with a really lemony vinaigrette. 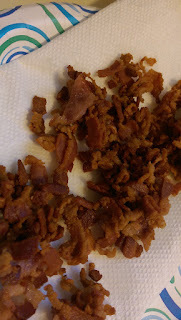 Cook bacon in a skillet over medium-high heat until crispy. Remove bacon to paper towels to drain, leaving the grease in the pan. 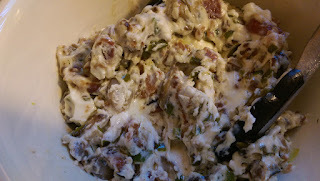 (Meanwhile, make cheese sauce--directions below) Add veggies to bacon grease and cook until softened, about 5 minutes. Add cream cheese and the cooked bacon to the skillet and stir until combined. Remove from the pan to a bowl and set aside. Wipe out skillet and add olive oil. Over medium heat, cook eggs just until soft-set. Add cream cheese mixture back to pan and fold into eggs lightly. Stuff the egg mixture into shells and line up in a 9x9 greased casserole dish. Pour cheese sauce over shells and bake 20 minutes til bubbly and golden. Serve with something acidic (like a tomato sauce or a salad with lemony vinaigrette). Melt butter in small saucepan over medium-high heat. Whisk in flour and cook for about 2 minutes. Whisk in milk, mustard and hot sauce and add cheese. Stir frequently until thickened and cheese is melted. Set aside until you are ready for it. 1. Corned beef is pretty easy to make, it just takes a loooong time. 2. When you prepare dinners ahead for the week, you get to do things like go to a free jazz concert at the library on a school night and still make it almost make it to bed on time. 3. At a jazz concert at the library, when the adults have finished laughing at the wise-cracking guitar player, your 4-year-old will most likely say "That's HILarious" in her perfect little outside voice. 4. Umbrellas do not make good toys on windy days. 5. I am able to run (when my child is heart-broken...see #4), I just choose not to. 6. When you haven't run for, well, ever, some part of your body will hurt at some point in the hours following the running event. 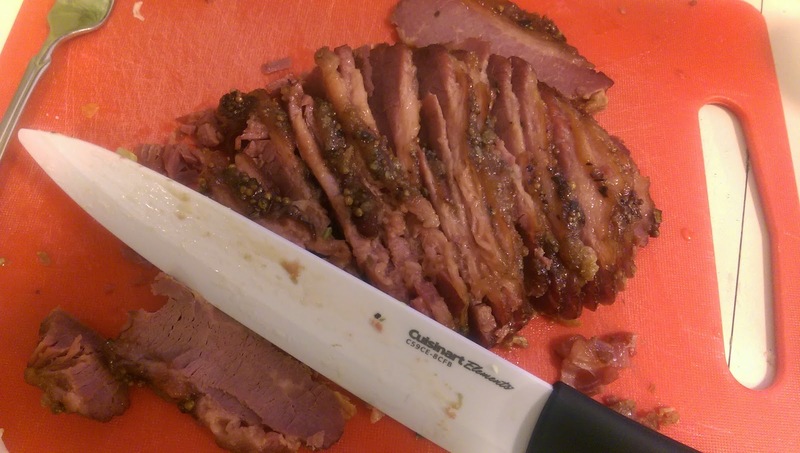 This was my first corned beef brisket ever. I was sharing with a friend (as I sat in her kitchen watching some ribs in her oven) that meat intimidates me. It's getting better since I have introduced a thermometer to my kitchen, and with practice I can now tell by touch when a steak or porkchop is done to my liking. But I am still a bit intimidated--part of it is that meat is expensive and you don't want to mess it up. This was a pretty big gamble on my part with this $10 brisket. I cooked the corned beef for about 4 hours on Sunday while I prepped some other dishes for this week. I baked it in the oven at 350, covered with foil for about 2 1/2 hours then uncovered for about 1 hour more. It still wasn't tender enough so I covered it again and baked it for 30 more minutes or so. Then I packed a layer of brown sugar on top and broiled it until the sugar got crusty. Whew, it worked--it's tender and moist. 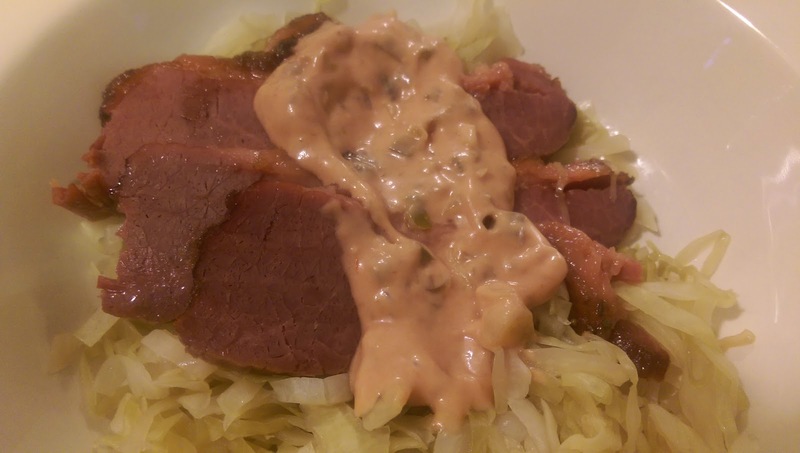 It is pretty salty (but okay with the dressing and cabbage, it's not overpowering). The next time I cook corned beef, I may boil it or soak it to get some of the salt out before roasting. 8. We learned that there is no answer but the truth when your super-smart-and-very-literal-six-year-old asks "Well, how do the baby rabbits get out of the mother's stomach if the doctor doesn't cut them out?" Spring is definitely in the air, you can smell it! And what do you do in Maryland when you feel spring in the air? 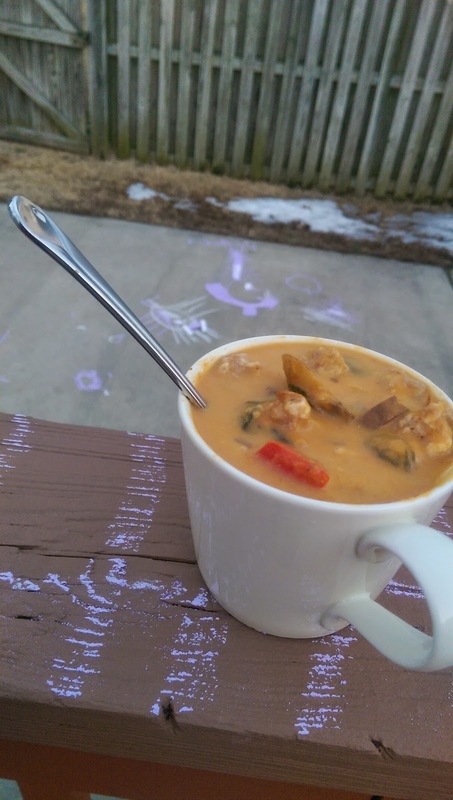 Why, you eat soup...outside...of course! What, you don't? So it's just us, then? which reheats extremely well. Sausage, onions, peppers, pumpkin, kale and some cream. 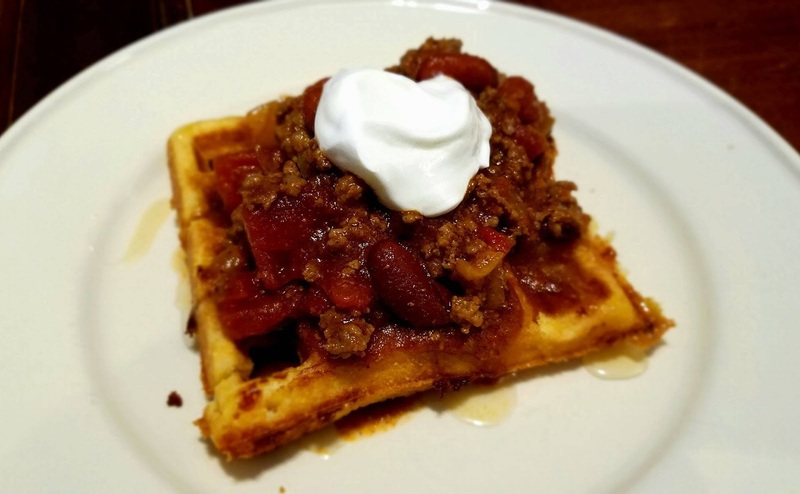 I made it the first time a few weeks ago and I had been jonesing for it again. Only I couldn't find baby kale again so I got spinach this time...still tasty but a bit slimy--stick with the kale. We were a bit late leaving school tonight as I was conferencing with a parent, so I'm very glad I had prepped for the week. And I am loovvving the time change and our new back yard!! The kids came through the house and straight out back when we got home. While I was heating dinner, hubby and I did that eerie thing married couples do...he said "where are the lawn chairs" at just about the same time I said "grab a blanket, we should have a picnic." And because I prepped, even though we got home late, the kids got to play with chalk outside, we had dinner, the biggest girl got two nights of homework and reading done, the littlest got a bath and I actually cleaned the kitchen all before bedtime! 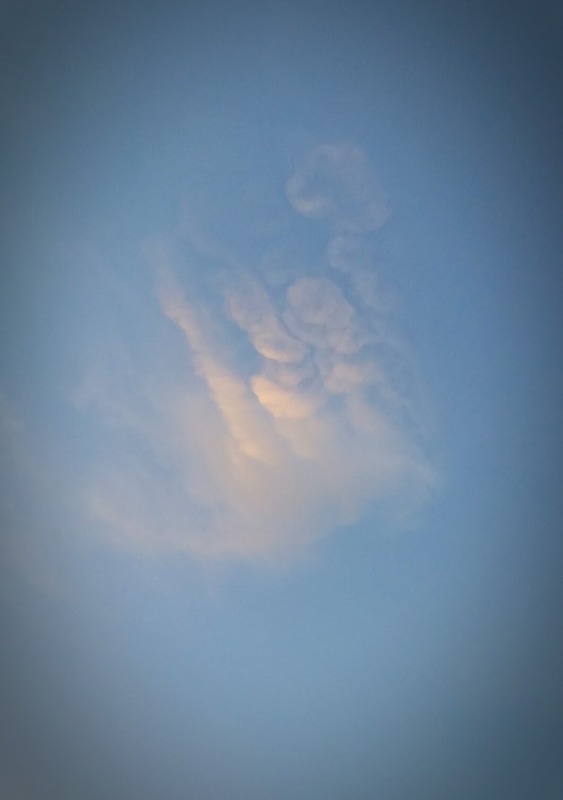 What a wonderful evening--we even got a cosmic high-five! !